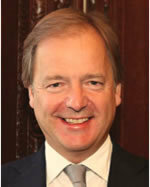 Argentina's policy of ignoring the views of Falkland Islanders is, "doomed to failure," Minister of State for the Foreign and Commonwealth Ofﬁ ce Hugo Swire told Falkland Is- landers prior to his visit in mid February. Mr Swire said these were genuinely historic times for the Falkland Islands. "Last year, the people of the Islands made headlines the world over, as pictures of votes being cast in the historic referendum in March were broadcast around the world. With a level of voter turnout that politicians in other democracies around the world can only dream of, the result was a clear expression of your wish to remain an Overseas Territory of the United Kingdom." He said it was a pity that the Government of Argentina continued to close its ears to that message. "It is shameful that they should make threats against those involved in legitimate economic enterprise or try to harm those seeking mutual trade and prosperity with the Falklands' neighbours." A nation of some forty million pressuring a community of three thousand in the twenty ﬁrst century, "is not an edifying sight," he added. "But there is another way," said Mr Swire, "Both the Falkland Islands Gov- ernment and we ourselves have said we wish to sit down with the Govern- ment of Argentina to discuss a range of practical South Atlantic issues, including natural resources, com- munications and conﬁ dence building measures. We believe we have much to talk about, and that there is value for all sides and for the region – in greater co-operation between us. "He emphasised however that such meetings, cannot, should not, and will not exclude the Falkland Islands Gov- ernment, "who must be party to any discussions affecting their future." He believes Argentina should wel- come that opportunity, "rather than spurn it. So let me be clear and unambiguous: if the Government of Argentina believes that hostile rhetoric and threats against the livelihoods of the Falklands people will pressure the UK into negotiating the sovereignty of the Falklands – above the heads of the people whose home it is then it is sorely mistaken. The British Government will abide by our responsibilities under the UN Charter to respect your right of self determination. Argentina may continue to choose to ignore the views of the Falkland Islanders, but it is a policy doomed to failure." The Minister stated that, "despite noises from over the water," the future of the Falklands looked increasingly bright. "You have a ﬂ ourishing economy based on ﬁsheries, agriculture and tourism. You have a signiﬁ cant budget surplus and enviably low unemployment. And you are investing, with ever greater success, in the education of your youth to equip them with the right skills in an increasingly complicated but interconnected world. "In addition to all this you now stand on the brink of great change, as oil production comes closer and closer to reality. I do not pretend that signiﬁcant challenges do not lie ahead. They do, and these developments will need to be man aged carefully. Some difﬁcult decisions will need to be taken. In all of this, though, we will of course continue to stand alongside you." During a press conference in the Falklands, Mr Swire emphasised that the British Government would like to see companies from all around the world taking part in hydrocarbons development in the Falklands, "including Argentina. "He said: "It is not the Falkland Islanders who are preventing it, it is one country who is trying to prevent other countries from getting involved and they won't be successful." Mr Swire said it was testament to the companies already in the Islands developing hydrocarbons, and those that want to come that they, "are not prepared to be bullied by Argentina." Asked whether he saw the involvement of American companies as helping in securing the Islanders rights to self determination, Mr Swire said he did not see those rights as, "under threat." The people of the Falkland Islands, "have spoken very very clearly," and the, "great majority of the international community accept that, he added.